A small, very flavorful round nut encased in a hard brown shell. As the names suggests these nuts come from the Hazel tree and are used to flavor ice-cream, cookies, pies, hot beverages, chocolates and more. Hazelnuts are edible and also make for a healthy snack. Choosing: Look for hazelnuts that have smooth, glossy shells. Good hazelnuts do not rattle when shaken, because this means it still retains some of it's moisture. Procuring: Hazel nuts are harvested annually in mid autumn. As autumn comes to a close, the trees drop their nuts and leaves. Most commercial growers wait for the nuts to drop on their own, rather than use equipment to shake them from the tree. Hazelnuts can be opened using a nut cracker. You can bake the nuts on medium heat for 10 minutes or until the skin begins to split. Then rub on the skins with a clean towel to remove the bitter skins.The kernel of the seed is edible and used raw or roasted, or ground into a paste. 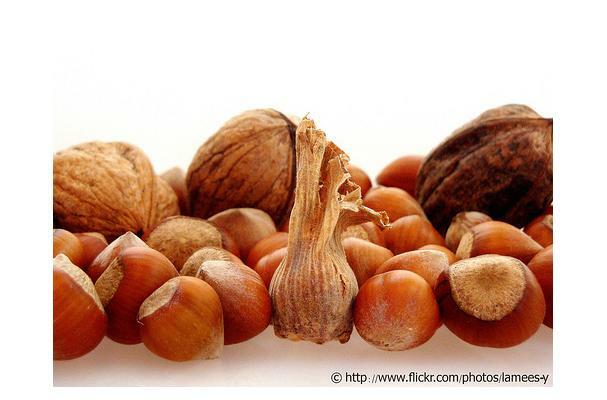 Hazelnuts are also used for livestock feed, as are chestnuts and acorns. The seed has a thin, dark brown skin and can sometimes be removed before cooking. History: Most hazelnuts grown in the United States come from Oregon. The Holmquist family, in Lynden, WA (Holmquist Hazelnut Orchards), grows a more natural hazelnut than the ones everyone is familiar with. They are more oblong in shape as opposed to round. They are really great tasting...sweeter, nuttier. They sell their nuts, in many different forms and seasoned flavors (as well as their cracked shells for garden walkways, etc), at the Redmond Saturday Market and several other farmers markets in the Seattle area.